Fr. James Gschwend, SJ, PhD is a member of Bellarmine’s resident staff. His background includes administrative positions in Jesuit high schools, working at Community Mental Health in San Francisco, and serving as Director of Spirituality in the sabbatical program at the School of Applied Theology in Oakland and Berkeley. 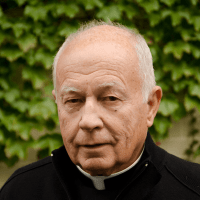 In Berkeley he also served as Assistant Rector for the Jesuit School of Theology. Following a fellowship year on the clinical staff at the Southdown Institute in Canada, Fr. Gschwend served the Chicago Jesuit Provincial as assistant for personnel, assisting men with healthcare needs and transitions in ministry.